Copyright: You grant LPOY and its sponsors and supporters including but not limited to USA TODAY, Popular Photography, American Photo, Popphoto.com, Amateur Photography and Outdoor Photography, a non-exclusive, irrevocable licence to reproduce, enlarge, publish or exhibit, on any media, the images for any purpose related to the Competition. Who can enter: Open to all photographers, worldwide. But your photo must be taken in the USA. Black & White – Literal or abstract monochrome images of any rural or urban landscape subject in the U.S.A.
Classic View – Color images of rural landscape in the U.S.A.
Urban Landscape – Literal or abstract color images of cities and towns in the U.S.A.
Official announcement of the winners will be made in Popular Photography magazine, USA TODAY and Amateur Photographer in April, 2014. A maximum total of 23 images per entrant may be submitted in any combination of award categories. 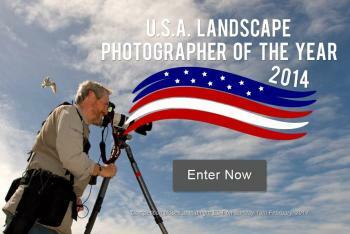 Entries must be images made in the U.S.A. Online submission of digital photographs via the website. Image requirements: jpg format; 72dpi with 1920 pixels along the longest length; between 1 and 2MB in file size. No watermarks, borders or signatures on your entry. All provisional award winners will be required to submit their image as a RAW file of at least 18 megapixels for inspection and if selected for the exhibition, for printing. Digital adjustments, including High Dynamic Range (HDR) imaging techniques and stitched panoramas are allowed in all categories.